All of the events we will be hosting during SFBW 219 can be found on the events page! Hope to see you at some of the awesome events!! We hope to see you soon! Cheers!! Just a heads up: We will be closed next Wednesday for the 4th of July! We are giving our employees the day off to celebrate with family and friends. We will reopen with regular business hours on Thursday July 5th. Just a heads up- we will be closing at 4 pm on Sunday April 22nd. We apologize for any inconvenience. Cheers! Come on down and have a couple beers and check it out!! Cheers! We will be open on Tuesday 12/26 for a Grilled Cheese Pop up! We will ONLY be serving a variety of grilled cheese’s from 11:30-3 pm (or when we run out 😉) and the bar will be open until 5! 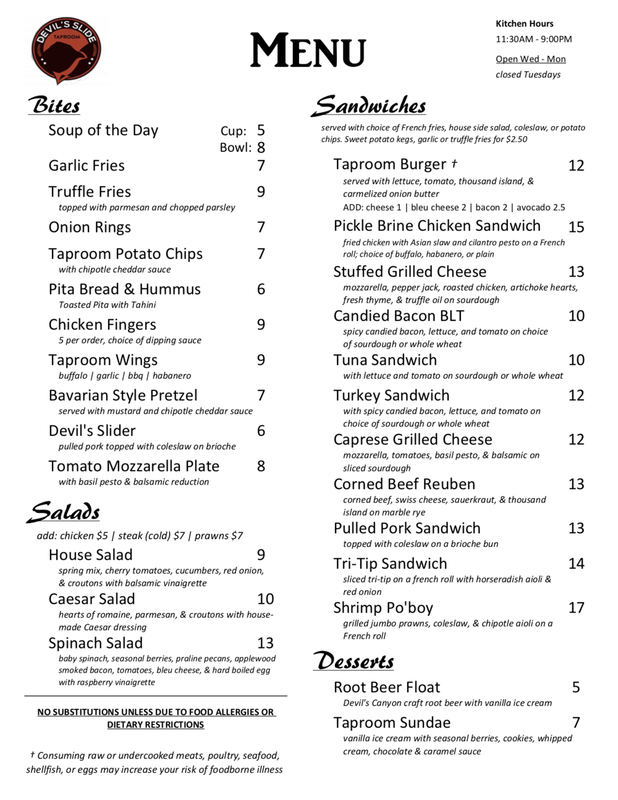 We have made some changes to the menu as late Fall is upon us. Please see the "Menu" section for the complete menu. Chicken Fingers: aka: “adult chicken tenders” 5 per order. By default, these come plain with choice of ANY dipping sauce: ie: ranch, bleu, bbq, chipotle, etc. Shrimp Louie: this comes with 4 poached prawns, romaine lettuce, avocado, cherry tomatoes, hardboiled egg, & cucumber. A wedge of lemon and thousand island dressing come on the side. Corned Beef Reuben: standard choice of sides. Sauerkraut made in house. Falafel Plate: this item come with falafel balls, hummus, tahini dressing, pita bread, and a Greek Country Salad consisting of tomatoes, cucumbers, olives, and onions in a simple marinade. Ribeye Steak: This replaces the Sirloin on the menu and is a larger 10oz cut. Catch of the Day: A fresh seafood special offered daily. 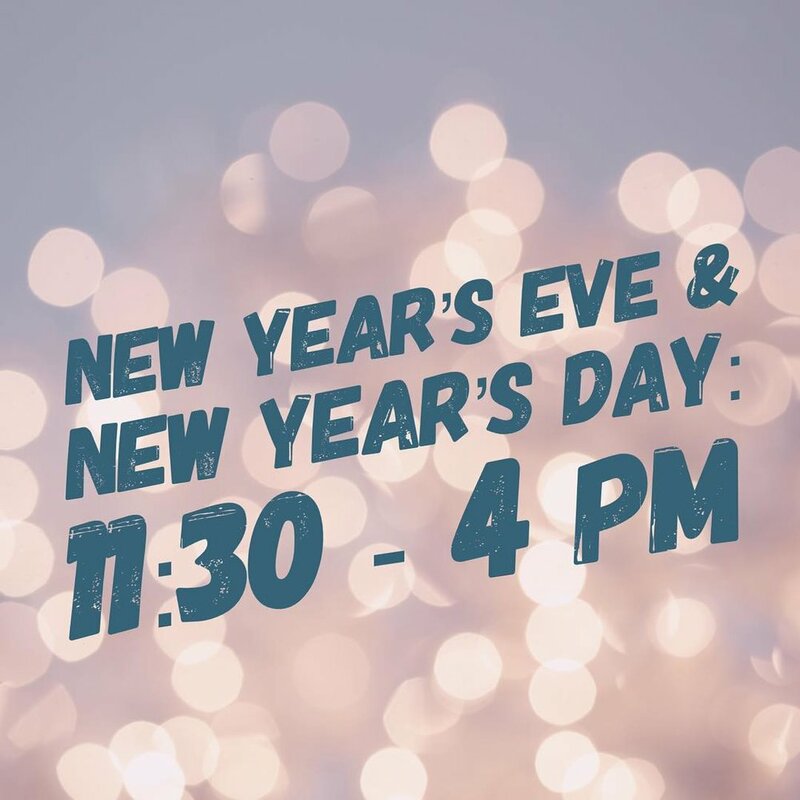 Kitchen will be open until 9:30 pm on Friday and Saturday night. We removed Olives from the appetizer menu but put Onion Rings back on! We added prawns as an option for the salads. Added the Shrimp Po' Boy as a menu item! Removed the Roasted Half Chicken. Modified Veggie Sandwich: It is now a wrap and with zucchini instead of asparagus. Once again we will revisit in a couple months. We hope you enjoy the new menu! Moody Tongue Brewing Dinner was AMAZING! We had an amazing tasting dinner last night with food paired with beer from Moody Tongue Brewing Co. We are looking to do another one like this in the near future! We are very excited to announce that we will be rolling out a new menu starting tomorrow at lunch. Please take a look in the menu section. We will be closed on Easter Sunday April 16 so our employees can spend the day with family and friends. We will reopen with regular business hours on Monday April 17. Please come in and fill out an application or send resume to devilsslidetaproom@gmail.com. 2. We will be closing the kitchen at 9 P.M. on Friday and Saturday nights. Hope to see you in soon! Cheers! 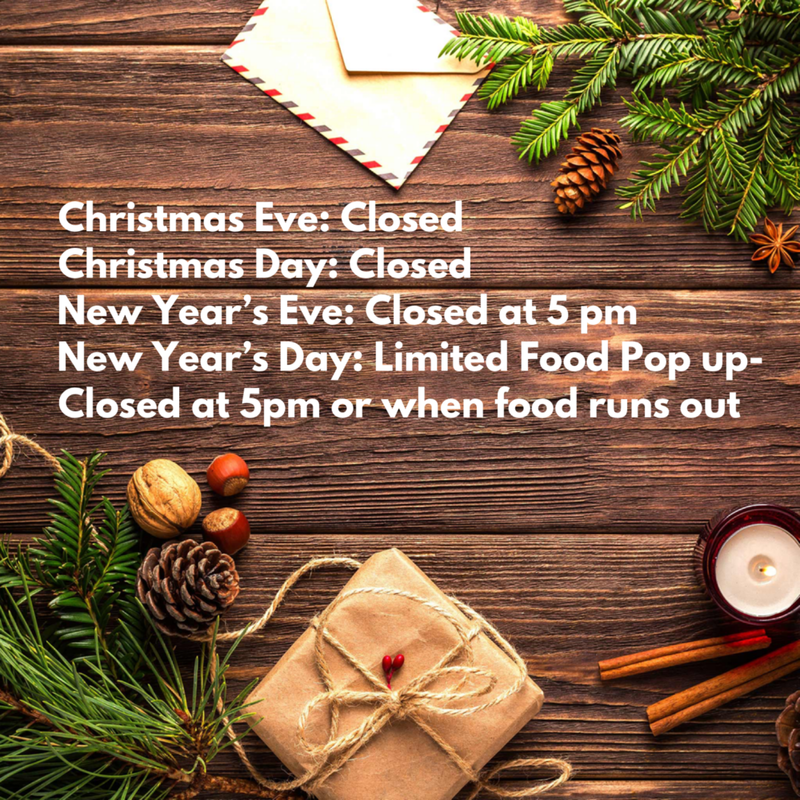 Monday After Christmas 12/26: Open BUT with a VERY LIMITED MENU consisting of Crispy Chicken Tacos, Spring Rolls, Wings, Onion Rings, Fries and Kegs- THAT IS IT!